Blackjack is a famous card game which is also known as Twenty-one, because of the main meaning of the game - to collect the total number of points that should be no more than 21. This game is played in all casinos all over the world. In spite of that it is not easy enough and it is not a game of fortune like Baccarat, for example, Blackjack still provokes enough interest among gamblers. Maybe, people hope on strategies that they could apply in order to win some money. Blackjack's strategy is based on card counting and till our times it has variety of counting systems. Which one is the more useful is hard to tell, but in any case, to understand logic of this game it is obvious to learn about Blackjack odds and rules. Blackjack is played by many people simultaneously. The dealer passes two cards to players and one card to himself. All cards are faced-up. The main goal of each player is to improve his combination of cards by collecting total number of 21 points, but not more. The dealer will also try to improve his cards, but the number of his total points should be no more than 17. Cards have their values: Queen, King, Jack an 10th have 10 points, Ace has either 1 or 11 points, all other cards has their initial values. Combination of Ace and 10th is called Blackjack. In spite of variety of strategies that exist, blackjack has one significant disadvantage for players and one major advantage for the house. It lies in fact that dealer makes his turn after all players. 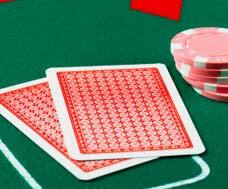 Therefore, even if both player and dealer have a hint on busting, player's chance on lose is higher than that of the dealer's. House edge in this game, however, is lower than in any other casino games. 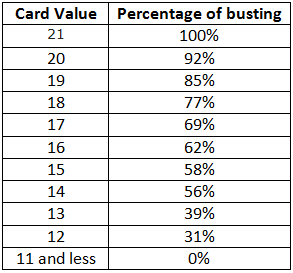 Here is a table, which emphasizes player's odds of busting.